MEININGER Berlin East Side Gallery is located directly opposite the longest surviving part of the Berlin Wall, which today is an open-air gallery. 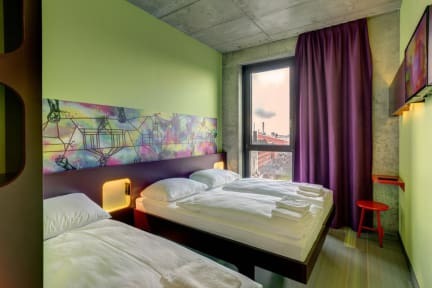 The location of the Hostel in the center of the city, gives you the change to explore with comfort the capital of Germany. What’s more, the tourist hotspots of the trendy district of Friedrichshain-Kreuzberg at Warschauer Straße can easily be explored on foot. All other sights of the city are within easy reach thanks to the hotel’s proximity to Ostbahnhof station (S-Bahn train towards Mitte). The Mercedes Benz Arena is only 300 meters away. 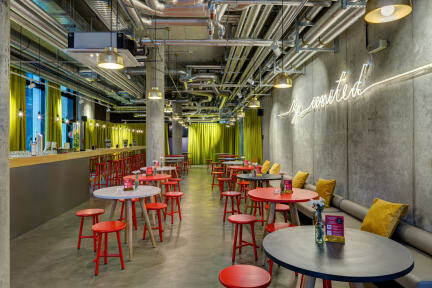 Located within walking distance of Warschauer Straße, one of Berlin’s most frequented tourist areas, and mainline railway station Ostbahnhof, which handles around 100.000 passengers daily, the hotel will have excellent connections to public transport. Our hostel is an ideal starting point for shopping and sightseeing excursions. What makes this district so beloved is its unique atmosphere generated by the innumerable bars, cafes, restaurants and clubs around the hostel. We are very fond of this district. Its unique charm is incorporated in our house. Do what you like, but only if you like! In the lounge, you can put your feet up with a good book after a long day, or enjoy free internet access on your laptop. If you fancy a cool beer and a chat, you'll find both at the bar. For a match of skills between old or new friends, we offer a gaming area. Here, everybody will find something to their taste, whether in one of the countless restaurants round the corner, or in the Hostel itself. Our guest kitchen is at your disposal to conjure up your favorite dish while our in-house washing machine is doing your washing. Or if you don't feel like cooking, we also have vending machines. We offer accommodation in single and twin rooms, shared rooms or a dormitory. All rooms have their own bathroom with a shower and toilet and are equipped with a TV set. No need to bring bedding - this is included in the accommodation. Payment upon arrival by cash, credit cards (Visa, Mastercard), debit cards. 24-hour Reception. Our young and multilingual team is there for you 24 hours a day with help and advice. Under such circumstances, there is really nothing stopping you from having an unforgettable stay! Guests under 18 years can only stay in private rooms with parental agreement. Maximum stay in dorms is 14 days. You must be 18 or older to stay in a dormitory. a) For cancellations made 59 to 30 days before expected arrival, 30 percent of the agreed-upon total price will be due. b) For cancellations made 29 to 10 days before expected arrival, 50 percent of the agreed-upon total price will be due. c) For cancellations made 9 to 1 day(s) before expected arrival, 90 percent of the agreed-upon total price will be due. Super nice place for a we in Berlin! Close to the station, and to many cool place long the river! Camera pulita, ben organizzato e ben collegato col centro città. Lo consiglio. Wonderful position, you can reach practically any main touristic attraction by train without having to change line. Not to talk about the nightlife: the coolest discos in Berlin are all around here and you can walk there. Need to say that the private rooms were quite small. Yet the worst was the service: the night we arrived one of the bed was not prepared and istead of preparing it for us the reptionist gave us blankets and let us do it. Ostello carino e giovanile, ma purtroppo la zona era poco raccomandabile (data la vicinanza della stazione). Comodo arrivarci e comodi i trasporti. Sconsigliato a gruppi piccoli(per la zona). Luoghi comuni molto belli (cucina comoda e pulita). Ci è stata data una camera un po' troppo piccola per 6 persone. Inoltre l'aria condizionata non andava e la finestra non si apriva più di 10cm rendendo la stanza un forno.